There has been some recent and past interest expressed in making the f150online.com galleries easier to search but, as you all know, with just about any 'added feature' to the site comes an additional 'added cost' that is associated along with it. 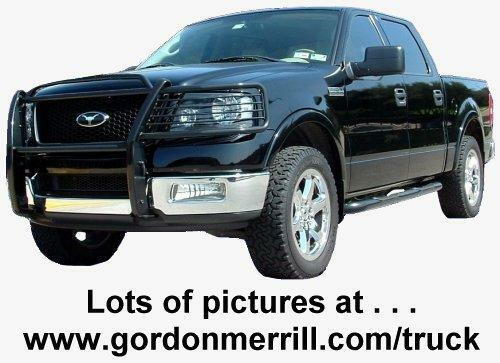 So, with that in mind, this is a thread that is dedicated to posting your photo gallery associated with your 2004 F-150. Feel free to type a quick list of your major modifications so that it can be a bit easier for folks to research adding mods or investigating the possibility of other items. Please keep commenting to a minimum as I know this thread will be a very busy one. Sorting through pages of comments makes it a very daunting task to research anything and thus, excessive questioning etc will be removed without notice. If you want to ask a question, either click on the user's profile to EMAIL them or start a new thread specific to the mod in question. PLEASE INDIVIDUALLY LIST YOUR MODIFICATIONS SO THAT OUR MEMBERS MAY SEARCH WITHIN THIS THREAD FOR ITEMS THAT THEY MAY BE INTERESTED IN DOING TO THEIR TRUCKS! SIMPLY POSTING A LINK TO YOUR GALLERY ISN'T ENOUGH INFORMATION!! Last edited by Rockpick; 04-03-2005 at 04:45 PM. Last edited by Zinc001; 09-22-2004 at 03:22 PM. 2004 SCREW McGaughy's 2/4 drop, 20" American Eagle 026 wheels w/ 275/55/20 Pirelli ATR's, Ford 5" chrome nerf bars, Homelink in overhead console, AF1 intake, EDGE Evolution tuner, SIDO exhaust, Extang bed cover, Bed Rug, Mark LT handles, leather seats. Kenwood 7017 w/ DVD, KNA-G510 navigation, iPod interface, rear view camera, Play Station 2, monitors in rear of headrest, XLT console. Last edited by GB150; 06-03-2007 at 06:04 PM. Hopefully the link in my signature works, I'll add more pics when I get it cleaned up. Last edited by Thayer; 04-05-2005 at 12:02 AM. Last edited by Bluerider; 10-22-2004 at 12:59 PM. Last edited by JohnAndDar; 10-15-2004 at 04:46 PM. XM Commander installed in place of the cigarette lighter, antenna in front of 3rd brake light. Last edited by TUFF FORD; 06-02-2005 at 03:21 PM. Location: somewhere east of west. bg grd / soon to come new exhaust - tires - breathing devices..
Last edited by jztbcz; 09-06-2004 at 06:14 PM. 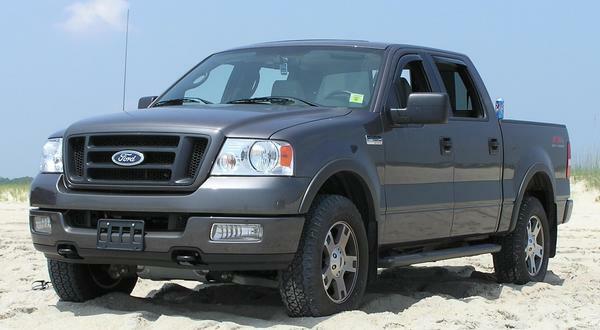 '04 Lariat Supercab 4x2, Black/Arizona Beige, 3.55 LS, trailer tow, captain's chairs with console, bright tubular step bars, only mods right now are 30% window tint and a Ford low profile critter shield. 2004 SuperCrew (SCrew) Lariat 4x2 ... black exterior, tan interior, flow-thru console, 6-disc CD changer with Audiophile, trailer tow package, 3.55 LS, and reverse sensing system (RSS). Ford 5" Step Bars (6L3Z-16450-CE). Last edited by GordoPanocho; 02-10-2017 at 08:14 PM. Last edited by Zoltan; 04-22-2005 at 09:16 AM. Last edited by MRILEY; 09-25-2004 at 08:17 AM.